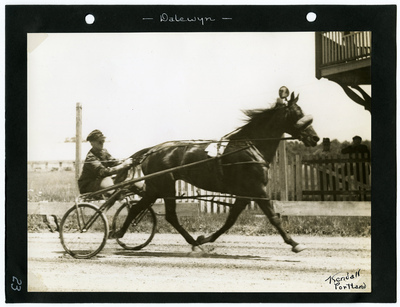 Black and white photograph of bay mare Dalewyn wearing head number two, Lohnes up, during the cool down following the first heat of the 2.09 Bar Pace on Saturday, July 6, 1940. Dalewyn showed with a third place finish in the contest. The photograph is signed in the lower left-hand corner by photographer Guy Kendall.